Whether you think Ed Snowden is a patriot or a traitor or somewhere in between, it certainly has been an interesting couple of years in the secure email business. It is a continued series of ironies, starting with the fact that Snowden had trouble convincing his chosen scribes to make use of encrypted email technology itself to transmit his documents. As I wrote about earlier this year, since Snowden’s revelations, more people have been motivated to employ encryption than ever before. That is a scary thought. But I don’t want to debate this here; instead I wanted to take a closer look at both new and older email encryption technologies and how much they actually protect your communications. I took this two-year mark of Snowden’s unintended flight to Russia to write this review of seven different products for Network World. 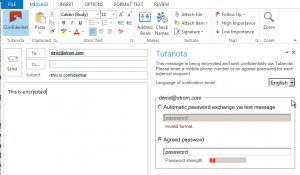 They include Hushmail, ProtonMail, Datamotion SecureMail, HP’s Voltage SecureMail, Tutanota, Virtru and AppRiver. Using one of them will certainly be better than not using any encryption, even if it raises your profile with certain three-lettered agencies. 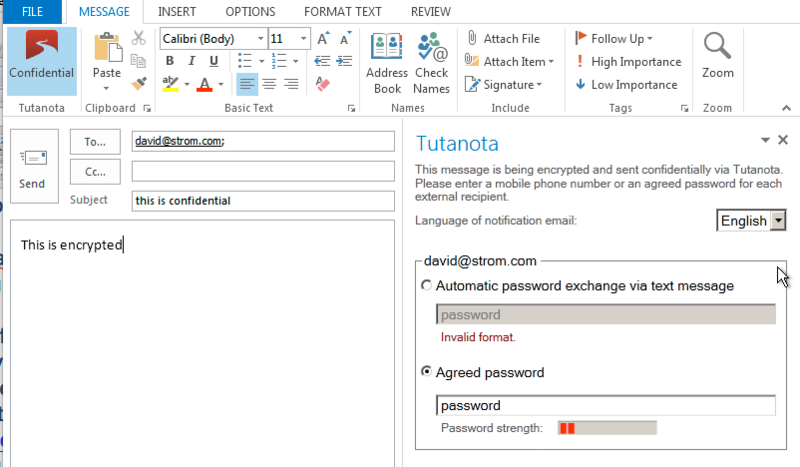 Tutanova’s Outlook plug-in is pictured above. This entry was posted in email, Email encryption, Product reviews, Published work by dstrom. Bookmark the permalink.